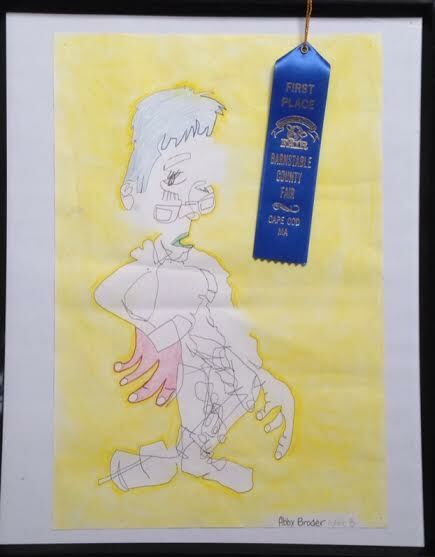 STEM Student wins Art Award at Barnstable County Fair this summer! Abby Broder, a current 8th grade student submitted one of her projects from Grade 7 Art to the Barnstable County Fair over the Summer. She only recently told Ms. Mills about it! At the beginning of the year, students were introduced to the concept of “Blind Contour Drawing.” A blind contour is a drawing that is done without simultaneously looking at the page while drawing. It teaches students to simply study a subject with their eyes, and mimic the path of their eye with a pen on a page. The concept teaches students to draw on the “right” side of the brain. The following was written by Abby Broder. The contest that I entered for was The Barnstable County Fair 2015 in July. The category was for colored pencil artwork. Ages 12-18. The award that I got in the category was first place! My entry was a blind conour drawing. A blind contour is when you have to study and focus on somebody, and try not to lift your drawing instrument and to keep track what you are drawing and keep your eyes in sync with it. When my mom was taking pictures of it, there were people who came over and took pictures of my artwork, and that was really amazing that some random person I don’t even know likes my artwork. Abby is an active member in the STEM Art club and an extremely talented artist. Well done Abby! !